A course checkout ride was completed on Saturday and you will all be glad that it was. Both the original cue sheet and the original GPS track contained errors that would have left you wondering. BOTH have been updated and posted on the website. If you are planning to ride, make sure you have the version marked REVISION 1. We started the checkout ride in the rain. There are several metal grate bridges and railroad crossings along the way that are especially treacherous when wet (one rider went down in spite of all the warnings). The bridges and railroad crossings are marked in the cue sheet. You will want to heed those precautions, even if it's not raining. Summer humidity usually means a heavy dew settling just after dark. These hazards will be slippery. ALSO NOTE: there is a short (~1/2 mile) section of gravel road on this route. Earlier recon rides found a wonderfully smooth stretch with near stone-free wheel tracks that made for nice riding. It appears that new gravel was added not long before the checkout ride. We had to deal with loose stones, but not deep gravel. My hope is that the road condition will return to its normal state by the time of the brevet. The gravel section is noted on the cue sheet. Thanks to a very understanding group of volunteers who added about 5 extra miles of wandering about as I reworked the route on the fly in the steamy afternoon heat. 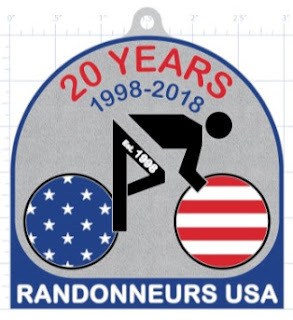 We are going to do something really different in honor of RUSA's 20th Anniversary: an evening brevet start. Why? A few reasons, but most notably because night riding, in case you don't already know, is a lot of fun. The tunnel of light cast by a bicycle headlight limits what you see clearly. Clouds or a moonless night mean you might not even seen anything outside of the headlight beam. Other senses must pick up the slack to satisfy you mind's craving for stimulus. Sounds and smells you might otherwise ignore are suddenly at the fore. An evening start has better potential to avoid the heat of the day that is typical in August without necessitating a trip to the Poconos. It is rare for overnight temperatures to remain above 80. You might even want to bring along a pair of arm warmers as overnight lows in the 50s are not beyond possibility. PBP starts are generally in the evening. What better way to discover how your body will respond than to try an evening start event? Night riding encourages riding with with others. During the longer events we usually recommending grouping up as darkness falls. There is safety in numbers. A group of reflector-clad randonneurs stands out to motorists. There are more eyes scanning the road ahead for gravel, potholes, and the occasional nocturnal animal scurrying across the road. Navigation is usually easier with more people; some can read cues while other scan the darkness for road signs. Camaraderie! Starting with one of PA Randonneurs' perennial favorite routes, The Brandywine 200, a few changes were added to simplify navigation in the dark and to adjust controls to locations that will be open regardless of the hour of your arrival (well, save for one info control). While a full moon is a week away, the First Quarter coincides with our ride so riders will enjoy a decent amount of moonlight providing the skies are clear. There are numerous vistas along the route that should be spectacular in the moonlight. This event will also allow lighting systems to be tested. Riders are cautioned that this route covers predominately rural areas. Street lamps are few and far between. Portions of this route were scouted during a New Moon which further emphasized the absence of artificial lighting. A helmet-mounted 1000+ lumen auxiliary lamp helped, added so I could read road signs while checking a cue sheet, but anything not directly in my light beams remain unseen (though not always unheard). All riders are required to have at at least one bike-mounted headlight and two taillights. A backup headlight is strongly encouraged. Battery powered lights are excellent choices for your backup headlamp since it is very hard to deal with mechanicals using dyno-powered lighting alone. You'll also want a light for reading a cue sheet. Fresh batteries are recommended for all of your battery powered lights. You will also find batteries at the control locations. Full reflective gear is also required. Requires are listed on the event page. Lights and reflective gear will be checked at the start before you receive your brevet card. A post-ride breakfast is planned for the finish. Not since a snowy December day in 2009 has PA Randonneurs visited Cafe Metzler for breakfast. Thankfully, we do not anticipate any wintry weather this time. George will be cooking up a variety of breakfast items that will surely include pancakes, bacon, and eggs along with plenty of drinks to replenish you after a long night's effort. Breakfast will most likely be ready around 6am (our current plan). You could end up having to wait for breakfast if you return to the finish significantly faster than 11 hours. A post-ride nap could be risky since Cafe Metzler does not offer a wake-up service. 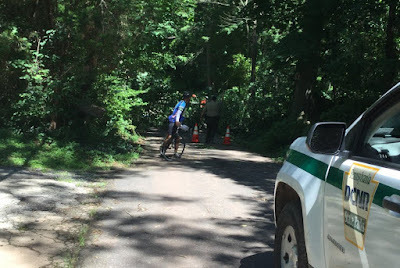 With all this in mind, the organizers emphasize that this brevet is not a speed contest. Average speeds should be lower owing to the increased challenge of nighttime navigation. Route changes in the interest of simplifying navigation also mean it is possible to ride the route more quickly. This is especially true compare to the Brandywine route from which it is derived. This route has decidedly fewer vertical challenges in the second 100k. Our hope is that all riders will resist the urge to shoot for a course record and instead enjoy the adventure. Ride at a more relaxed pace, take a little extra time at the controls or interesting places along the way, have a conversation with your fellow randonneurs as you ride, and finish closer to 11-12 hours than 8-9. To help, the second control in West Chester is an open control. It was noted on an early scouting adventure that there are a number of streetside cafes and pubs along Market St. which are quite inviting in the evening. You can still control at the 7-Eleven if you wish, but a receipt/initials from any of the eateries along Market St will suffice. You should treat the 7-Eleven as a point of no return. There are almost no options for a West Chester control beyond that point. It promises to at least be something different. This is not your ordinary R12 brevet. Also different is that there will be unique hardware passed out to successful finishers. Like may RUSA events occurring in August of this year, we celebrate RUSA's 20th anniversary. So you'll get a really cool medal (see image above) when you finish. What more could you ask? Registration is open. Check out the event page and sign up now.